Looking at homes and yards and the way other people decorate and landscape is a lot of fun. 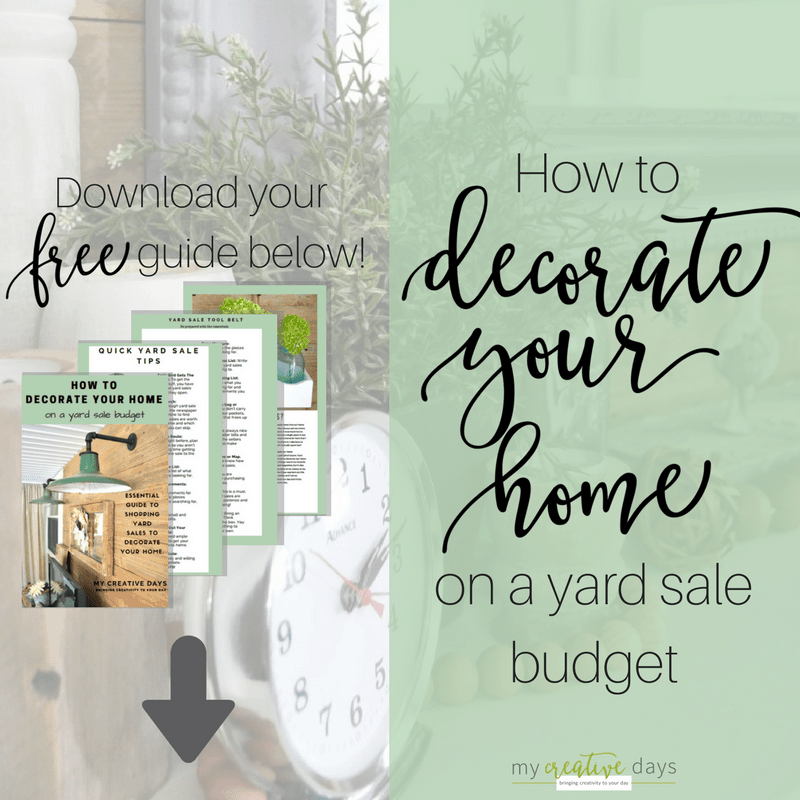 I usually come away with some great ideas for us to try in our home and yard. 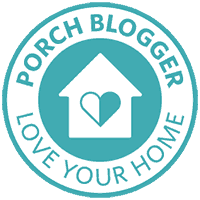 I don’t see many blog tours of the outside of blogger’s homes so I was super excited when Tara from Lehman Lane asked me to join this group of blogging friends to bring you our Summer Outdoor Tour. 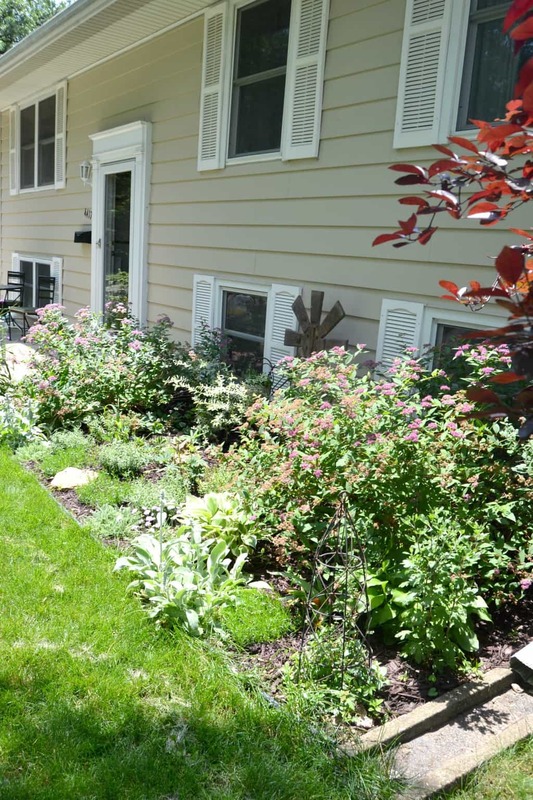 We have teamed up to give you a little glimpse into what the outside of our homes look like. For us, the outside of our home is just as important as the inside. We work in the yard just as much as we do on the inside of the house. This Summer Outdoor Tour 2016 is going to show you some of my favorite spots in our yard. Let’s start this Summer Outdoor Tour with a view of the front of our home. When we bought the house, it was a mint green color. We changed the color and added a new front patio/porch at the front door. We have also added a TON of new plants to the front of the house. This year, we bought a lot of new plants for the right side of the house. We wanted to fill this area with plants and we can’t wait to see how it matures over the next few years. 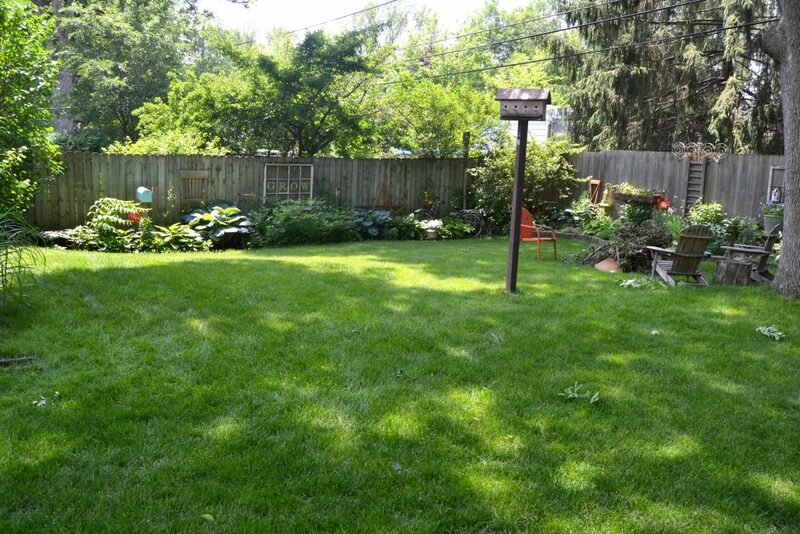 This is a wide view of some of my favorite parts of our back yard. We use old mailboxes to hold garden tools. Broken rocking chairs become planters. 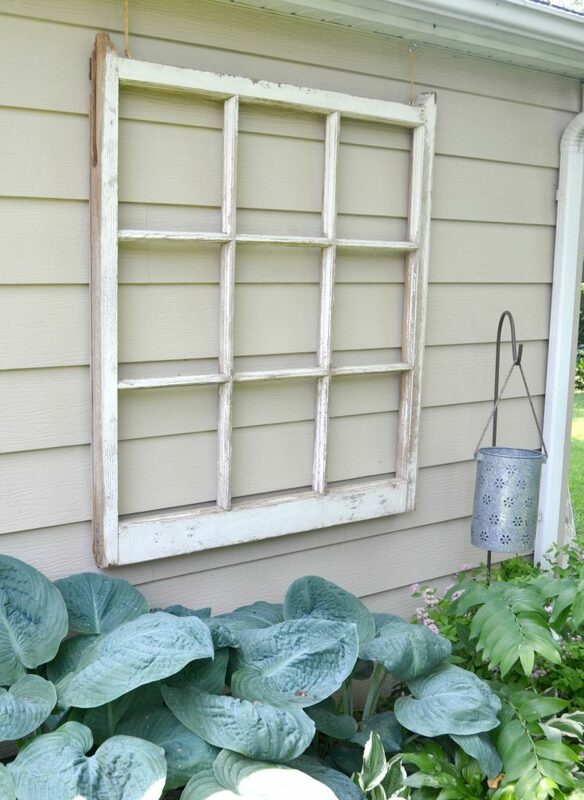 And, old windows make the best art on our fence. 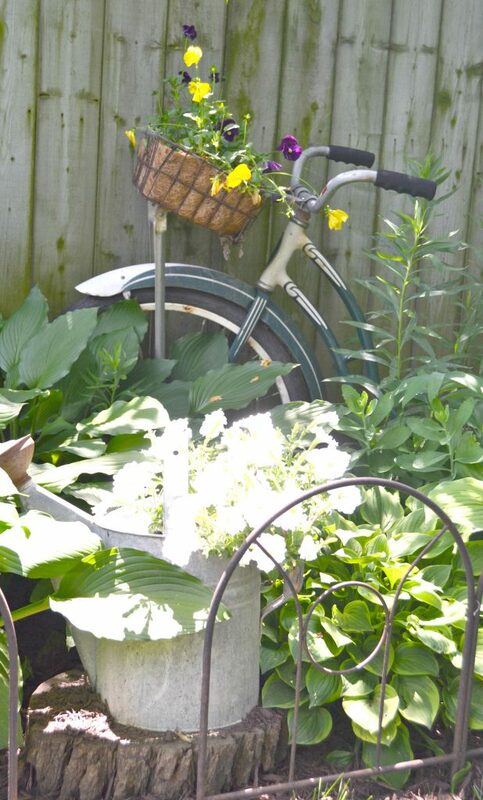 Vintage bikes make the perfect spot to grow flowers. 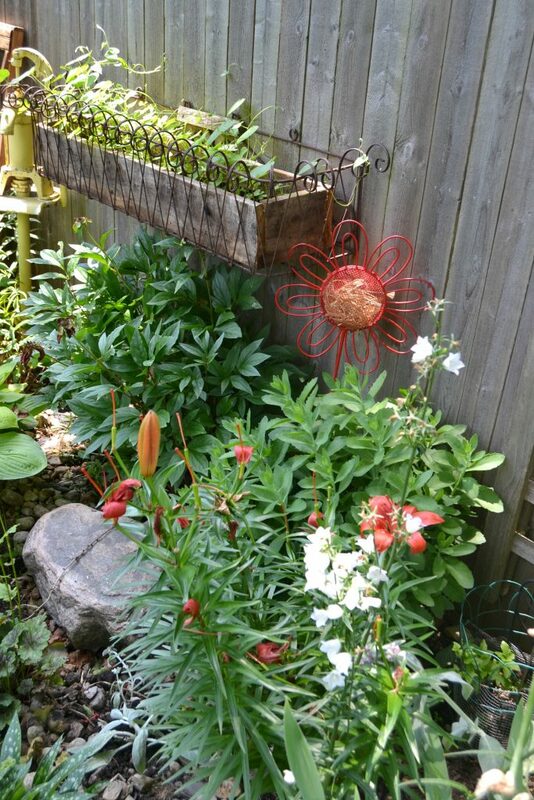 And, crooked bird houses add some whimsy to chippy trellis’. This $3 crusty, wobbly bench was the perfect addition behind our garage. 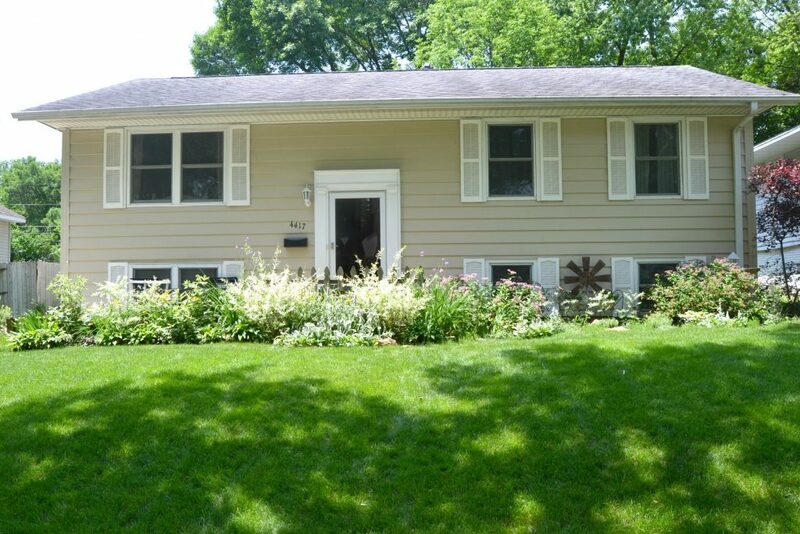 And, these huge windows were exactly what I was looking for for the side of our garage. We just brought them home from a barn sale and I am hoping to add some window boxes full of flowers to them. This area in our yard is always evolving. We keep adding, moving and taking out plants as it needs it. 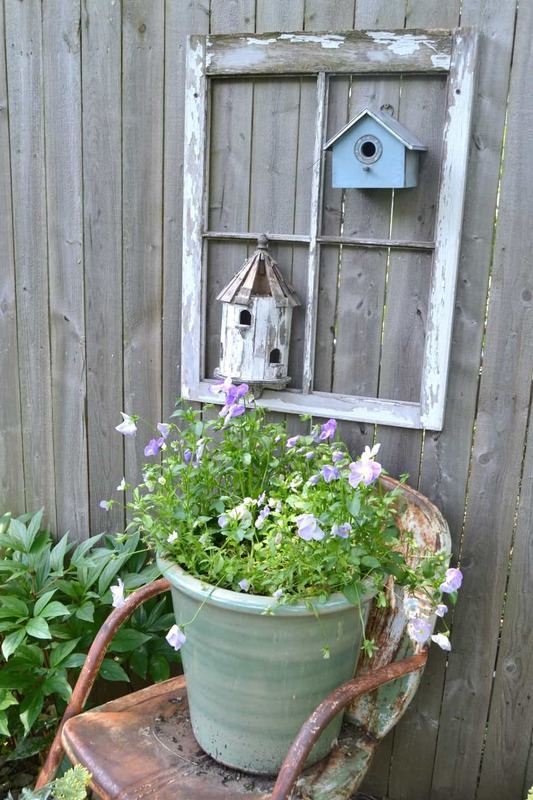 A rusty chair, a big pot of flowers, and an old window frame with a couple of bird houses is all we needed in this corner. 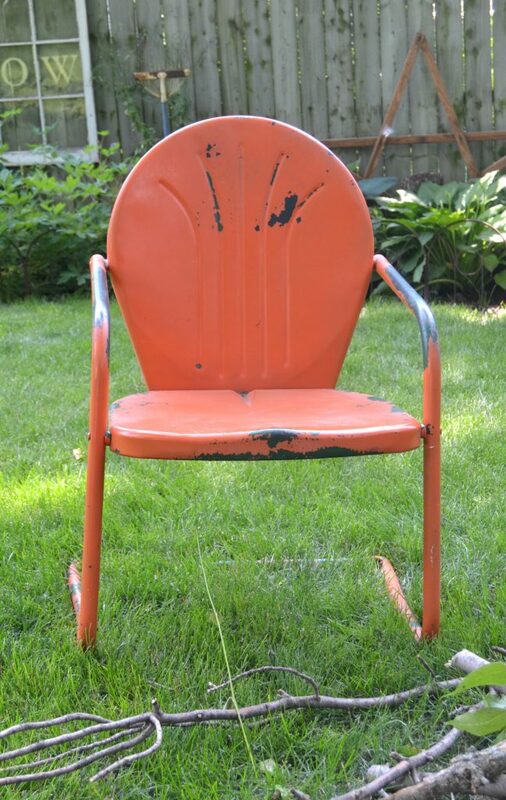 This chair was another recent find. The orange color with the dark green peeking out was perfection and we needed another seat around the fire pit. Lindsay – we LOVE your garden space. You are so creative! 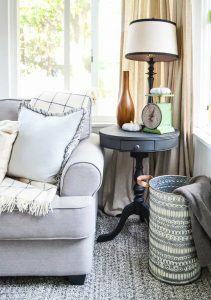 Your reuse and up-cycling talents really shine! The “grow” window and the birdhouse trellis are our favorites! You have such a fun backyard full of character, Lindsay. 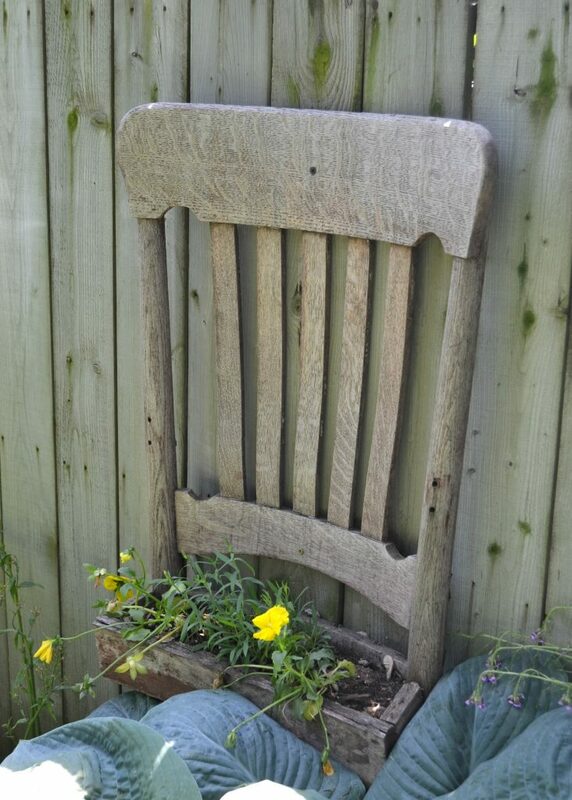 I love that rocking chair turned planter! Love those huge hostas that you have too. Great tour! Lindsay, I can tell just how much hard work you have put into your landscaping and outdoor space. What a great idea to add a patio to the front of your home and your back yard looks so serene and peaceful! 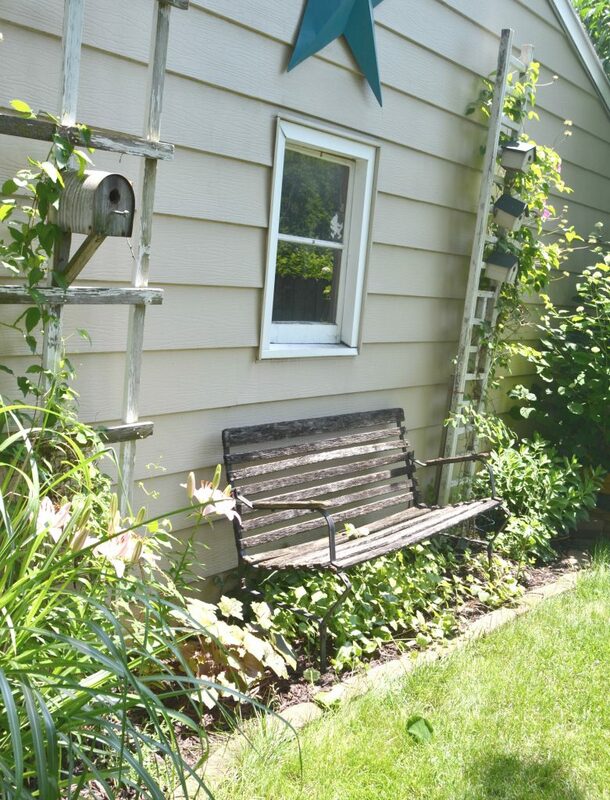 I use a mailbox to store my garden tools too and you have so many great vintage pieces:). 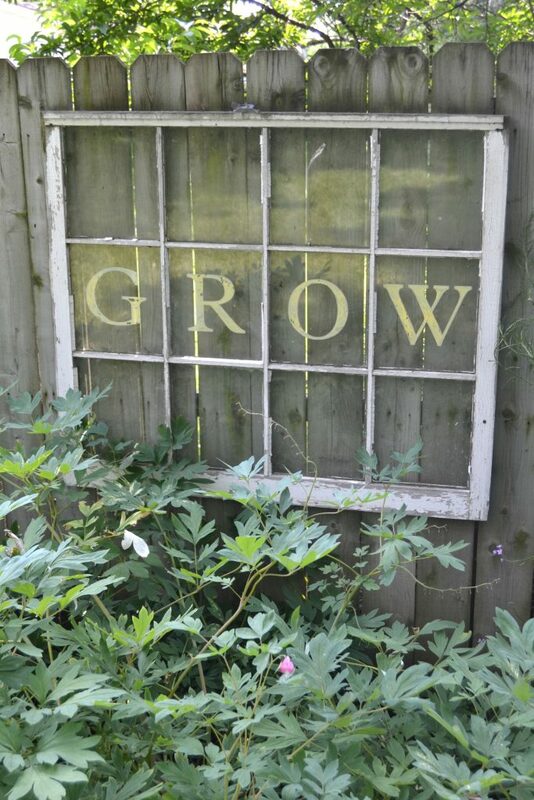 I love that old window in your yard. What a great idea to add more flowers to them in the future! I am so glad you could join our garden hop. 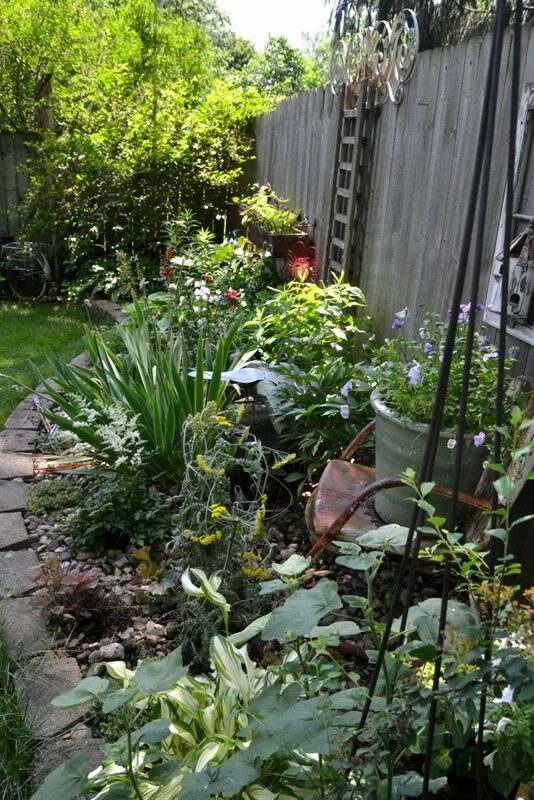 Thank you so much for sharing your pretty outdoor space with us!!! Thank you so much for having me Tara! 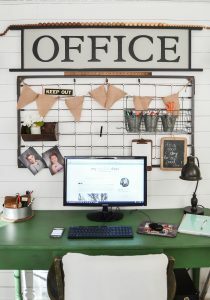 Lindsay – you have just given me SO MANY IDEAS for what I can do on the side of our garage! Our patio is right next to it, and it desperately needs a little “art.” I love all of the collected finds you’ve worked into your backyard. It adds so much charm! 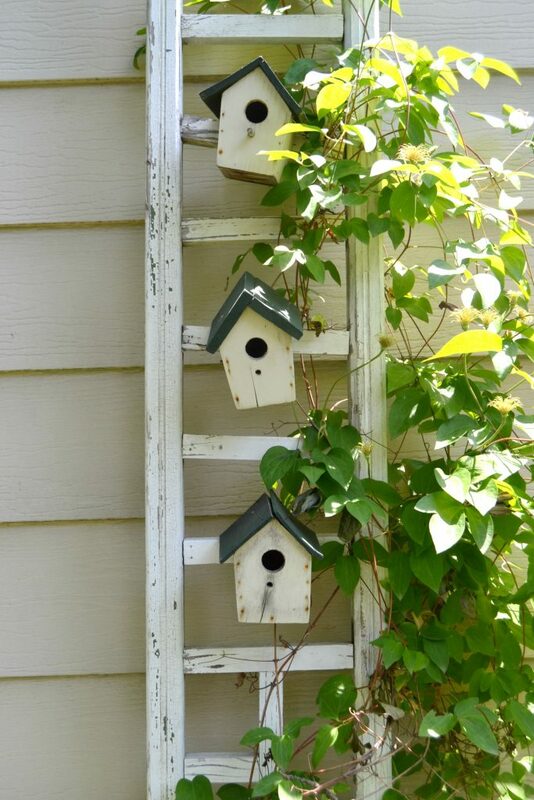 I really adore youur birdhouse trellis. I will have to make one — thanks for the inspiration! I love all your creative planters like the bike and ladder! 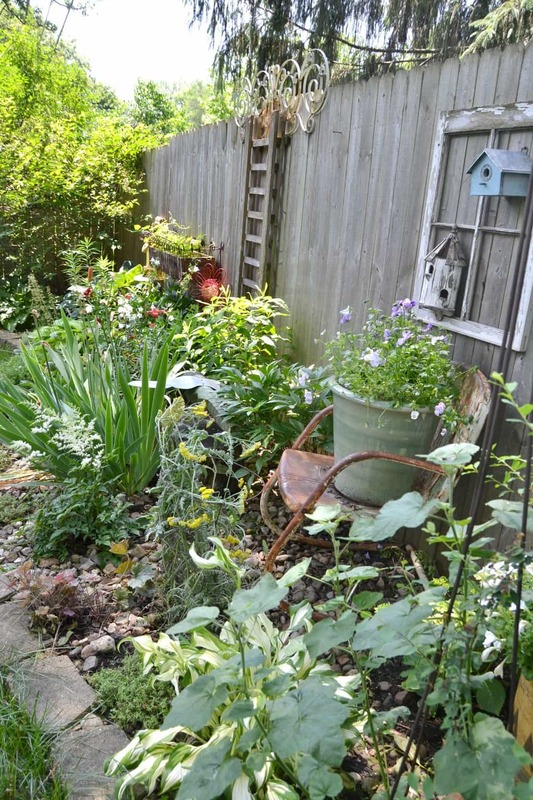 Your yard is so beautiful! I love your yard! 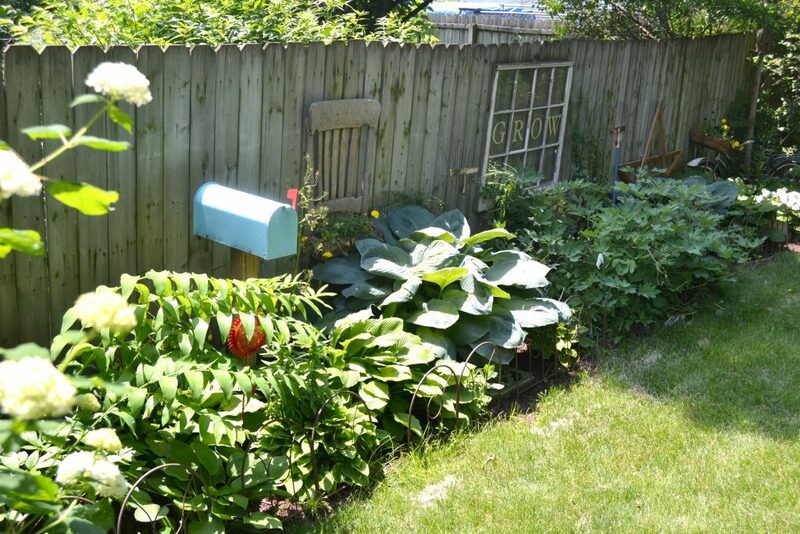 How fun to use the mailbox for gardening tools. 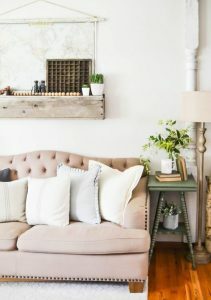 And I love the chair turned planter and old window! Thank you Marie! We just painted our siding! It is holding up and looks so much better. We were going to put all new siding up and then my dad said just paint it! Literally only took about 4 cans of paint! We saved tons of money! Your backyard speaks to my vintage and chippy loving soul!! Once we can finally finish up our back garden area, these are the types accents I want to bring into the space. I love all the repurposed planters!!! Thank you Jenny! 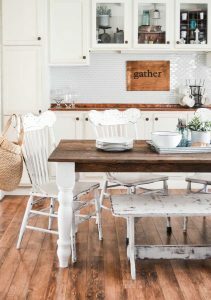 I love vintage and chippy goodness!!! Lindsay, I am so jealous of all of your beautiful shade and greenery. I have little to no shade in my yard, and I can’t wait for the day that I either move to a shaded home, or these little trees of mine grow. Thanks for sharing all of your beautifully decorated spaces with us! I love your colors of grey and how they work so good together. You are so creative and in a way, I really admire. My precious mother passed away Oct. 2016 unexpectedly and going into the house to clean out to sell had me overwhelmed and sad. So much so that I didn’t grab any antiques or much of anything. I just wanted her there with me in the house. I am so sorry for your loss Janet. You still have all of the memories. Those will never go away. Thanks for stopping by!